July 5, 2017 was a big day for The Village Angels of Tanzania. 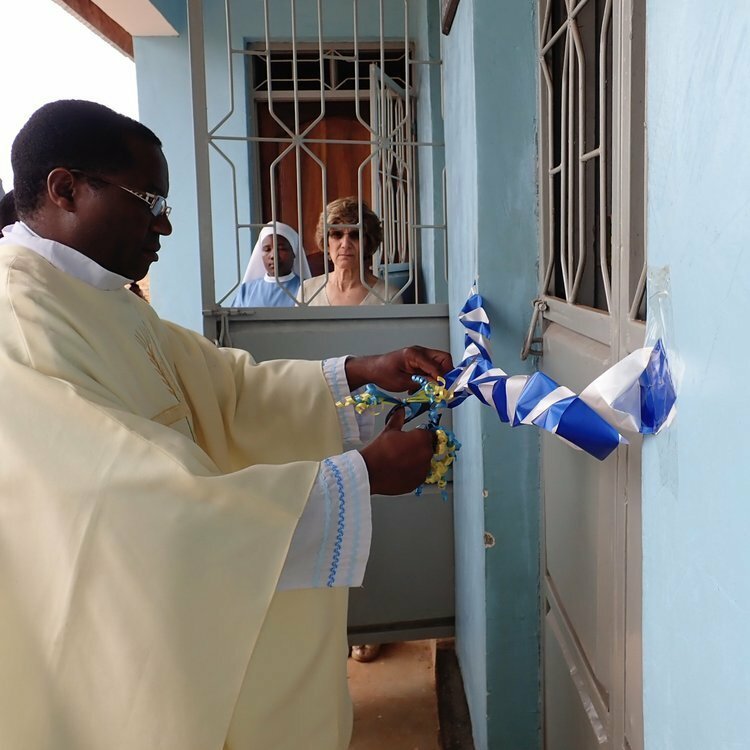 In front of about 200 people, including most of our elderly, our newly-constructed multipurpose building was dedicated to Fr. Martin Rauscher, Pastor Emeritus of Assumption Church in Morristown and founding member of the Board of Trustees of The Village Angels of Tanzania. It was Fr. Martin who raised the seed money for the program, at the time when it was just a great idea on a sheet of paper. The festivities consisted of a Mass, a ribbon cutting ceremony, the blessing of a plaque that Johanna & Sergio Buhrani brought from Morristown, the planting of a tree and lots of singing, dancing and drumming. Rauscher Hall consists of a multipurpose classroom/meeting room, plus storage space for foods and supplies. It is placed in the middle of a small campus, with hundreds of banana trees and lots of space for the expansion of our vegetable garden. Rauscher Hall also includes a Sewing Room, where our youth will learn new skills and be able to sew clothes for the elderly and for sale in the local market. The room accommodates six sewing machines and an embroidering machine. The equipment was purchased through a generous contribution of the La Rosa family children and grandchildren, in honor of Lillian La Rosa, who was an accomplished seamstress for most of her life. Each of the elderly received a fleece jacket and a pair of flip-flops. They got back a lot of "Asante sana" (thank you&apos;s). Then everyone proceeded on their way home. As you can see, everyone came to the gathering in the best clothes. The fleece jackets and flip-flops that were distributed are from the generous donations by the many supporters of The Village Angels of Tanzania. "Asante sana" to everyone who contributed to make this possible. The fleece jackets will keep the elderly warm on the cool nights in Tanzania. During their stay, Johanna & Sergio will distribute fleece jackets and flip-flops to all the elderly served by The Village Angels of Tanzania. Visit the Village Angels of Tanzania website to learn more about our organization and how you can help.